A compilation of Nazi crimes by witnesses, victims, historians and perpetrators taken from hundreds of sources. Has anyone ever confessed to you or to one of your fellow priests any atrocities they took part in during the extermination process? In Daugavpils, the second-largest city in Latvia, southeast of Riga and approximately equidistant from Riga, Kaunas and Minsk, Obersturmführer Joachim Hamann of Einsatzkommando 3 directed massacres during August 1941that ended more than nine thousand lives…Among the murdered were four hundred children from a Daugavpils orphanage trucked to a military training ground and shot. At a dinner party later in the war, Viktors Arajs would explain why his experienced killers often threw children up into the air to shoot them: not because of a boyish exuberance, he said, but because the bullets often passed completely through the children’s bodies, so that shooting children on the floor or the street risked dangerous ricochets. On a spur off the main rail line to Munich they stumbled on thirty-nine stationary boxcars. Usually they were used for transporting coal. As they neared, they were overwhelmed by the stench of death. All the cars were piled high with rotting human corpses. In total, they contained the bodies of some 2,300 men, women and children. All were either totally naked or clad in their striped blue-and-white concentration camp clothes smeared with blood and excrement. Most had starved to death while being transported from Buchenwald nearly three weeks before. The train had reached the siding only two days prior to the arrival of the Americans, and the few prisoners who had survived the journey had been shot or clubbed to death by the SS. After entering Bialystock on the twenty-seventh of June, a city which the Germans had captured, like many others, without a fight, the battalion commander, Major Ernst Weis, ordered his men to round up male Jews by combing through Jewish residential areas. Although the purpose of congregating the Jews was to kill them, instructions about the manner in which the Germans would extinguish their lives were not given at that time. The entire battalion participated in the ensuing roundup, which itself proceeded with great brutality and wanton murderousness. These Germans could finally unleash themselves without restraint upon the Jews. One Jew recalls that “the unit had barely driven into the city when the soldiers swarmed out and, without any sensible cause, shot up the entire city, apparently also in order to frighten the people. The incessant shooting was utterly horrible. They shot blindly, in fact, into houses and windows, without regard for whether they hit anyone. The shooting lasted the entire day.” The Germans of this battalion broke into people’s homes who had not lifted a finger in hostility, dragged them out, kicked them, beat them with their rifle butts, and shot them. The streets were strewn with corpses. One witness claimed she had heard prisoners screaming in the punishment cells [at Auschwitz]. These ‘standing cells’ (height: 2 meters; Size: 50 by cm; air vent: 5 by 8 cm) guaranteed a slow death through starvation and lack of air. The bodies of the dead had to be scraped out of the cells with iron pitchforks. Some of the victims had eaten their own fingers. 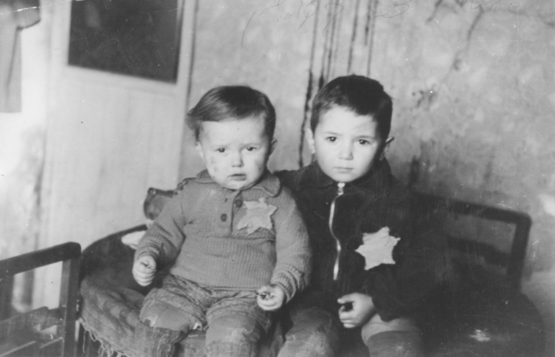 Five-year-old Avram Rosenthal and two-year-old Emanuel Rosenthal in the Kovno ghetto in Lithuania, before their deportation and murder. One morning, the guards asked all educated Jews [at the Minsk ghetto] – engineers, doctors, accountants – to register for work. Two days later, they were pulled out of the camp and shot. The Jews starved on nettles and potato peels, and lived in terror. “Suddenly, the Gestapo swoop down on the ghetto in trucks and began seizing men,” wrote Mikhail Grichanik, a tailor who worked at a garment factory in Minsk and spent several months in the ghetto before escaping; the Nazis executed his mother, his wife, his three children, and three other relatives. “They go into apartments, beat people with rubber truncheons and lead them out under the guise of sending them off to work: to the peat bogs and such places. No one ever saw any of those taken away alive again.” In September, the patriarch of the Kovarsky family reportedly watched, hidden with one of his sons, while the police stormed into his home and murdered his other two boys, both of his daughters, and their grandmother. The oldest girl was first ordered to take off her clothes and dance for them on the table. In late October, one company from the Twelfth SS Totenkopfstandarte occupied the town of Owinsk and began the systemic liquidation of the patients in the large psychiatric hospital there. The mentally ill were hauled away from the hospital in truckloads of fifty and shot by SSTV soldiers in groups on the edge of a mass grave. In less than a month, one company of Totenkopf soldiers murdered over 1,000 innocent, helplessly ill men and women. By Charles W Sydnor, Jr.
​So then came the Children’s Hour [their parents had been deported, probably to Auschwitz]. It was decided in the next few days to transfer three thousand, ranging in age from two to twelve (older ones had already been deported) from Pithiviers and Beaune-la-Rolande to Drancy [France]. The buses began arriving at Drancy on August 15, their engines grinding, raising clouds of dust in the courtyard. The children got off the buses and stood there, bewildered. They looked around and saw barbed wire and uniformed guards. They were hostages to the gods of darkness, but where was the God of children? He was not in strict attendance. In the courtyard, silent and confused, children four and five years old picked through the rows of bags, looking for their baluchon (bundle). The youngest ones did not know their names. One of them said: “I am Pierre’s little brother.” Some of them had cardboard name tags around their necks, but more often they had lost their tags, or the rain had washed out the names. Many were barefoot. Physically, they were in a pitiful state, undernourished and covered with vermin and open sores. Mentally, they were in a state for which childhood does not prepare one. What does a child, who feels life in every limb and breath, know of death? Drancy was not equipped to receive large numbers of children. They were kept in what was called the escalier de depart (departure stairway), where they slept in large barrackslike rooms, one hundred to a room, on straw mattresses on the floor. Many got diarrhea from the cabbage soup that was served at every meal. It was useless to wash their clothes or their mattresses, for a few hours later they would be soiled again. There were pails on the landing, as there would be pails in the cattle cars. And they waited. And they wept at night. On the day of departure, the children were awakened at five and dressed in the semidarkness. Some refused to move. They lay on the damp straw crying. The gendarmes, who had to carry them downstairs past the overflowing pails, were unnerved. They heard a four-year-old boy addressing his absent mother, repeating, “Maman, je vais avoir peur” (“Mommy, I am going to be afraid”). The children lined up in the courtyard, where bus engines were already running. It was still dark enough that the camp searchlights were on. Some children were pulling suitcases that seemed bigger than they were, and some were carrying bags made from bed sheets, and some were holding dolls and teddy bears, and it took two and a half hours to process them on the buses…Seven trains with children together with adults left Drancy on August 17, 19, 21, 24, 26, 28, and 31. Their progress from then on is painful to record…Children in the freight cars – like the subway at rush hour – for three days, in a closed and windowless car in the heat of August, with the stink, the lack of air, and the difficulty of relieving oneself. Those who survived the trip arrived ill and dehydrated at Auschwitz and were taken at once to the gas chambers. Not one survived. And some of those children were two years old. And they had been escorted to the border by French police, in the land of Voltaire and The Rights of Man. A Jewish person helping another Jewish person to evade justice constituted a very serious offense …On 6 November 1942, the Gestapo suddenly decided that Helene Krabs should be transported to the notorious Auschwitz-Birkenau concentration camp in Poland. Paul Krabs begged the Gestapo for mercy on behalf of his wife in two letters in early December 1942. In one letter he writes, “My wife was only acting in a compassionate manner. She simply felt a loyalty to her relative. It was an impossible situation for her. I beg for mercy on her behalf.” The Gestapo refused to change its decision. On 10 December 1942, the Gestapo reported that Helene Krabs had been sent to Auschwitz-Birkenau. Rudolf Hoss, the camp commandant, was informed about her pregnant state. On 3 January 1943, Helene Krabs was murdered, along with her unborn child, in Auschwitz. Jewish women from the Misotch ghetto (Ukraine) forced to undress before being executed. Notice the small children and infants in their mother’s arms. These babies were shot along with their mother’s. The men of Police Battalion 309’s First and Third Companies [at Bialystok] drove their victims into the synagogue, the less compliant Jews receiving from the Germans liberal blows of encouragement. The Germans packed the large synagogue full. The fearful Jews began to chant and pray loudly. After spreading gasoline around the building, the Germans set it ablaze; one of the men tossed an explosive through a window, to ignite the holocaust. The Jews’ prayers turned into screams. A battalion member later described the scene that he witnessed: “I saw…smoke, that came out of the synagogue and heard there how the incarcerated people cried loudly for help. I was about 70 meters’ distance from the synagogue. I could see the building and observed that people tried to escape through the windows. One shot at them. Circling the synagogue stood the police members who were apparently supposed to cordon it off, in order to ensure that no one emerged.” Between 100 and 150 men of the battalion surrounded the burning synagogue. They collectively ensured that none of the appointed Jews escaped the inferno. They watched as over seven hundred people died this hideous and painful death, listening to screams of agony. Most of the victims were men, though some women and children were among them. Not surprisingly, some of the Jews within spared themselves the fiery death by hanging themselves or severing their arteries. At least six Jews came running out of the synagogue, their clothes and bodies aflame. The Germans shot each one, only to watch these human torches burn themselves out. There had been many Jews among the sixty-five thousand men, women, and children who died in the camp. Buchenwald was not a death camp, like Auschwitz or Treblinka, specifically designed to annihilate the Jews. Prisoners at Buchenwald were worked to death or they died of disease, hunger, torture, and executions. All prisoners were treated horribly, but according to the most accounts, the Jews were treated worst of all. For Victor Klemperer, professor of French literature in Dresden, routinization of Nazi rule meant an ever-tightening trap. The university dismissed Klemperer in 1935…One insult and deprivation followed another. Klemperer was forbidden to publish. He lost borrowing privileges at the library, and eventually library staff refused even to let him use the reading room. Over the years Nazi regulations robbed Klemperer of his car, his house, his driver’s license, even his pets. The final year of the war had brought a rapid deterioration in the condition of Thereisenstadt’s inmates. Already in the fall of 1943, Jakob Edelstein had been arrested for having helped some inmates to escape the camp and was sent to Auschwitz with his wife, Miriam, his son, Aryeh, and old Mrs. Olliner, Miriam’s mother. While Edelstein was kept in block 11 of the main camp, his family was kept detained in the ‘family camp’ in Birkenau. On June 20, 1944, they were all reunited in front of crematorium III and shot. Jakob was shot last, after he had witnessed the killing of his son, his wife, and his mother-in-law.